subgenus Pinus, section Trifoliae (Duhamel), subsection Attenuatae (Van Der Burgh). 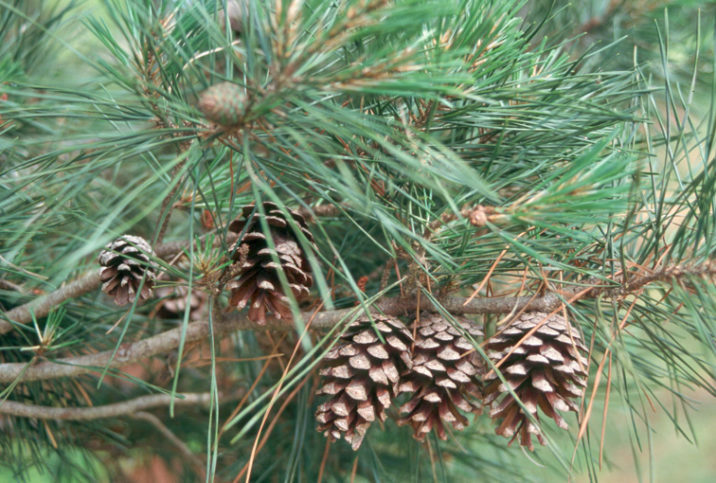 Pinus glabra, as described in 1788 by Thomas Walter (1740–1789), is commonly known as spruce pine, cedar pine, or Walter pine. The scientific name describes this pines smooth, waxy, hairless (glabrous) shoots and branchlets. Ethnobotany. Used for its lumber. Due to radically different drying rates, spruce pine cannot be intermixed with other southern pine species in lumber manufacturing. It can be made into lumber, but it must be dried separately. It is often used for large timbers and beams. Description. Spruce pine is an evergreen coniferous species of tree that grows to mature heights of 100 feet (30 m) with a straight, but is often bent and twisted trunk up to 40 inches (100 cm) in diameter, measured at breast height, and a pyramidal to rounded crown. Bark on mature trees is gray, fissured and cross-checked into elongate, irregular, scaly plates, lacking resin pockets. 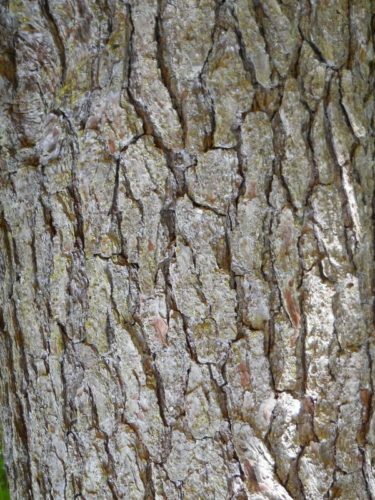 It resembles red oak bark, and is unlike any other pine in the region. On younger trees and branches, the bark is smooth and gray. Branches grow whorled, spreading to ascending. Twigs are slender, colored purple-red to red-brown, occasionally glaucous, aging gray, smooth. Foliar buds are ovoid to ovoid-cylindric, colored red-brown, measuring circa 0.2 to 0.4 inch (0.5 - 1 cm) and slightly resinous. Scale margins on foliar buds are finely fringed. Leaves (needles) grow in bundles of 2 per fascicle, spreading to ascending from the point of origin, and persisting 2 to 3 years on the tree. The straight, slightly twisted needles measure 1.6 to 3.2 inches (4 - 8 cm) long and 0.028 to 0.048 inch wide are colored dark green with lines of stomata all surfaces. Needles margins are finely serrulate, with an acute apex. Fascicle sheaths measure 0.2 to 0.4 inch (0.5 - 1 cm) with a persistent base. Pollen cones are long and cylindric, 0.4 to 0.6 inch (10 - 15 mm) long, colored purple-brown. Seed cones mature 2 years after pollination, shedding seeds soon after, persisting on the tree for a year or more. They appear spreading to recurved, nearly symmetric, long ovoid shaped before opening, ovoid-cylindric when open. Cones measure 1.4 to 2.8 inches (3.5 - 7 cm), colored red-brown, aging gray and attached with 0.04 to 0.4 inch ( 0.1-1 cm) peduncles. Cone scales lack a contrasting border on adaxial surfaces (as in P. echinata). Apophyses are slightly thickened and raised; umbo is central, depressed, unarmed or with small, curved, weak, deciduous, short-incurved prickle. Seeds are deltoid-obovoid shaped with a circa 0.24 inch (6 mm) body that is brown, mottled darker and a wing up to circa 0.48 inch (12 mm) long. 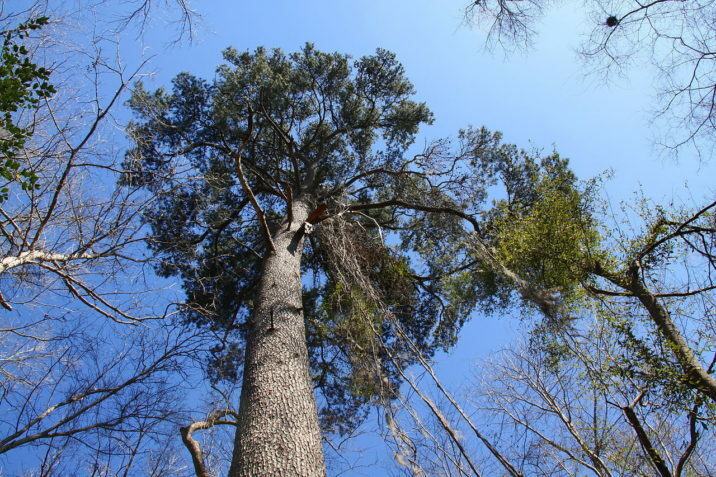 Mature, open-grown individuals have a very similar form to eastern white pine (P. strobus). 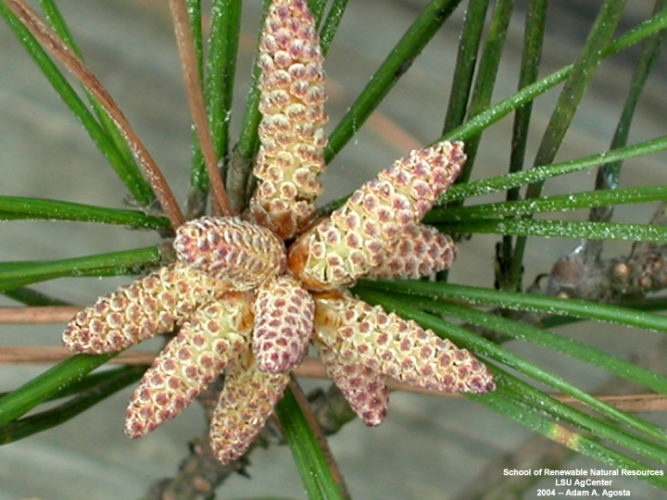 Its shoots and leaves resemble shortleaf pine (P. echinata) but cones are less prickly and leaves a deeper green. Distribution. This species is native to USA — South Carolina, Georgia, Florida, Alabama, Mississippi and Louisiana, growing in the sandy alluvium and mesic woodland of the Atlantic and Gulf coastal plains, at elevations of sea level to 500 feet (0 - 150 m) elevation. Hardy to USDA Zone 8 — cold hardiness limit between 10° and 20°F (-12.1° and -6.7°C). Attribution from: R. Kral, Pinus. Flora of North America Editorial Committee (editors); Flora of North America North of Mexico, Vol. 2. ©1993, Oxford University Press. Large Pinus glabra , Anderson Springs Trail, Twin Rivers State Forest, Live Oak, Florida. Pinus glabra — bark detail. Pinus glabra — mature seed cone detail. 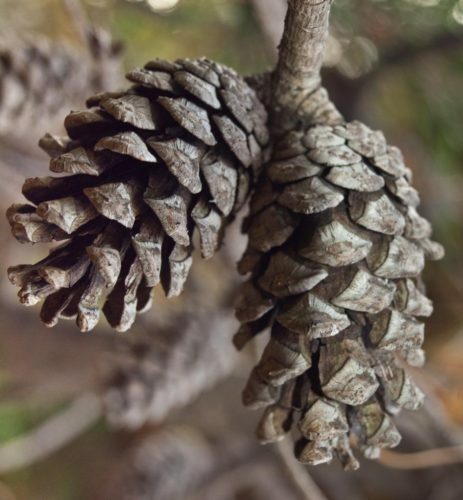 Pinus glabra — foliage and seed cone detail. Pinus glabra — foliage and pollen cone detail.